Central State University is a four-year, state-supported, coed university. It was founded in 1887 as…. Central State University is a four-year, state-supported, coed university. It was founded in 1887 as the Normal and Industrial Department of Wilberforce University. Although associated with Wilberforce University, the Normal and Industrial Department was considered a separate institution with its own Board of Trustees. The school became a four-year college in 1941, and the name was changed to College of Education and Industrial Arts. In 1947, the school began operating independently under the name of Wilberforce State College. 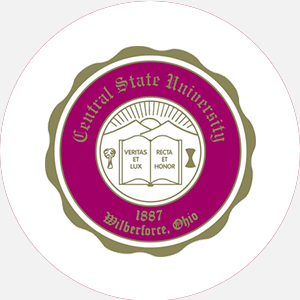 In 1951, the name was changed to Central State College, and when the school was granted university status in 1965, the name was changed to Central State University. Central State is Ohio’s only predominately black public institution of higher education and is also one of few black institutions located in the north. Former president Arthur E. Thomas said “As the University looks toward the challenges of the 21st century, it has positioned itself to be a leader in higher education that will prepare students for global markets, world economics and managing cultural diversity.” The Paul Robeson Cultural and Performing Arts Center, the James J. Walker Gymnasium, the Hallie Q. Brown Memorial Library, and the President’s home are four of six newer buildings standing alongside older buildings. The 60-acre campus is the home of America’s largest and most popular National Afro-American Museum and Cultural Center. Located on the east side of the campus is a power plant, as well as the University’s outdoor education area and natural reserve. The campus gained the distinction of being the only historically black college with a female professor of military science commanding a battalion. Central State University is accredited by the North Central Association of Colleges and Schools to award the Bachelor of Arts, Bachelor of Science, and Master’s in Education degrees. A copy of an official high school transcript and completion of the following 15 units: 4 English, 3 mathematics (including algebra I and II), 3 social studies (including two history), 3 science, 2 foreign language, and 1 visual or performing arts. Out-of-state students must have a cumulative GPA of at least 2.0. Students must present proof of a physical exam within the last 90 days prior to application. A nonrefundable application fee of is required. Bachelor degrees require a minimum of 186 quarter hours, with 3 hours in African American history, 15 in math, 8 in science, 5 in physical education, 1 in computer science (business majors), and completion of 71 hours of core requirements. All students must take 3 hours of university convocation, pass the English Proficiency Exam, and have a cumulative GPA of at least 2.0; education majors must have a 2.3 or higher. The last 36 hours must be in residence at Central State. Associate degrees require a minimum of 93 quarter hours. Campus Regulations: Unmarried freshmen and sophomores must live on campus. Cars are permitted. Campus Services: Health center; personal and psychological counseling; career planning and placement; tutoring; testing center for GMAT, GRE, LSAT, and GED; remedial instruction; and religious services, including chapel. Campus Activities: Social and group activities include theater, band, chorale, orchestra, and dance. Students may work on the student newspaper or yearbook. Communication majors can get involved in the campus radio station WCSU-FM (88.9), or the campus television station. Leadership opportunities can be found in the Student Government Association or numerous other groups. Greek sororities include Alpha Kappa Alpha, Delta Sigma Theta, and Zeta Phi Beta; fraternities include Alpha Phi Alpha, Kappa Alpha Psi, Omega Psi Phi, and Phi Beta Sigma. Housing Availability: 1,500 housing spaces. Freshmen required to live on campus. September–July (quarters) Commencement and conferring of degrees: June One summer session.